by way of introduction, i am both an enthusiastic driver (who had a brief career as a mediocre club racing driver) and an enthusiastic cyclist (who will probably never race, but does enjoy long rides). i tend to ride on bike paths or out in rural areas where i know the roads well. urban cycling scares me, as way too many drivers are not paying attention. so yesterday i found myself on NY 155 heading north, and then taking the short slip ramp onto Washington Avenue Extension (this is in Albany, NY, for those of you who aren't from around here.) A cyclist was crossing 155 from my left to my right and our paths were about to cross where the slip ramp merged into Washington Avenue Extension. so what did i do? well, being a cyclist myself, i recognized two things - first of all, that per the rules of the road, he had the right of way and i was obligated to yield it. and second of all, that most drivers don't really get this and he was probably going to be very concerned about my intentions and my attentiveness. so as i came around the slip ramp, i deliberately hung back and paced him, while looking straight at him. when he looked over at me to see what i was about to do, we made eye contact. this turns out to be enough information for him to decide that we are actually going to follow the correct rules of the road, so he signaled that he wanted to move across to the shoulder. i waited for him to do so and then gave him plenty of room on my right as i accelerated by. and he was apparently very appreciative of the fact that it was all done correctly and waved at me as i moved on. what can we do to teach every one, drivers and cyclists alike, to do these things properly? new 27" rims are hard to come by. 700c is easier, but 36 spoke rims are hard to get in either size. look for 28H or 32H hubs. 28H front/32H rear is a fairly reasonable thing to do. new 126mm hub options are limited, and the quality is uncertain. good used and NOS hubs abound on ebay, major, quality brands like Mavic, Shimano, & Campy are not hard to get. 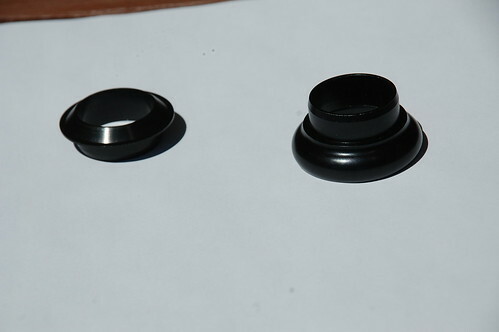 there are both freewheel and freehub options available in the ebay environment. if you're buying a freewheel hub on ebay, attend to the threads: Sheldon Brown's article on freewheel threads. stick with ISO. Shimano made some 126mm cassette hubs in the early 90s with the now-obsolete Uniglide splines. Most of these can be converted to the modern Hyperglide, and some used ones on ebay have already been converted. The Shimano cassette hubs for 126mm were made in the Deore mountain bike line and in the Exage and 600 (Ultegra) road bike lines. The Deore is quite heavy and tough, heavier than most road bike riders will be interested in. The 7 speed hyperglide freehubs swap right onto Uniglide hubs. Sheldon Brown claims you can take some 9 speed hyperglide cassettes, remove one cog, and get an 8 speed cassette that fits on the 7 speed hub. This works for the heavier cassettes that don't use spiders. 8/9/10 speed hyperglide freehubs can swap onto the uniglide hubs. these appear to end up slightly wider than the 7 speed freehubs (about 2mm), but still can be gotten to fit on steel frame bikes without violence. Some wheelbuilders warn about excessive dish, others think it's no big deal. i'm a little baffled at why Shimano doesn't publish basic specs for their current brake calipers, like reach. i have an older bike, originally equipped with 27" wheels, now converted to 700C. 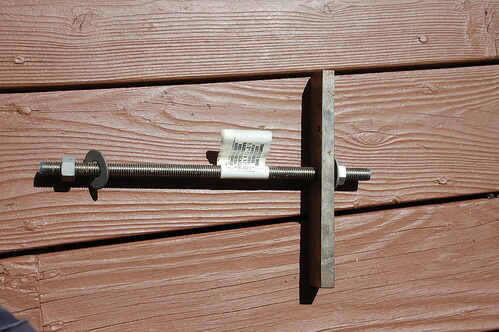 the ancient (1984) Dia-Compe calipers are traditional single pivot, they work ok, and there was just enough adjustment available to permit me to use them with the slightly smaller 700C wheels. the pertinent spec is called reach, and it's the distance from the bolt attaching the caliper to the frame to the spot where the pad is fastened to the caliper. it's a range, e.g. 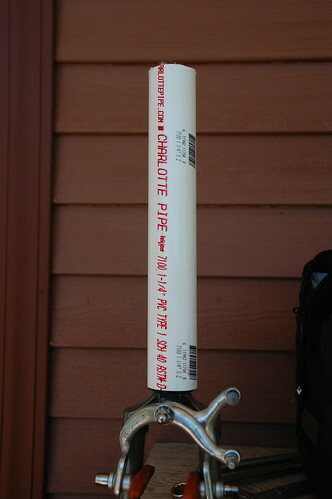 47mm-57mm. newer bikes typically have shorter reaches. this isn't something i paid much attention to until i decided that perhaps i wanted to convert from the old single pivot Dia-Compe calipers to a newer dual pivot. i started going through current Shimano products, and found it fairly difficult to establish what ranges their calipers covered. Eventually it became clear that none of the higher end Shimano calipers will fit properly on my 26 year old bike. Phase 2 ended up not being quite what I projected. 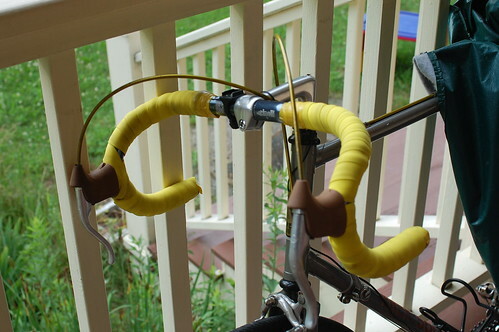 The problem was the handlebar and stem. The Belleri parts that Trek spec'd in 1984 don't have a good reputation for longevity. Given that handlebar failure is a fairly unpleasant event, I opted to put handlebar replacement ahead of the bar end shifters. 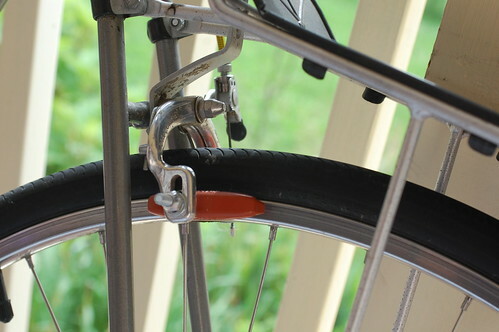 As I've already documented, I did change the original Tange headset out for a Stronglight A9, and I also replaced the ratty old brake shoes with new Kool Stops. So what's happend? The headset is already covered in the linked blog post, so first, the new Kool Stop pads. These are the Eagle 2 shoes from Harris on the rear. They are quiet, effective and trouble free. 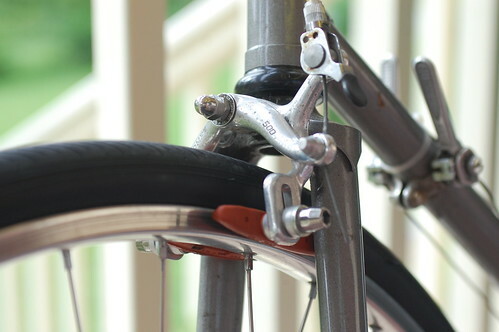 These are the Thinline shoes from Harris on the front; there are frequently clearance issues in front on vintage bikes, hence the different (thinner) pad. These were briefly very noisy (painful squeal), but are very adjustable and with some toe out they quieted right down (the rear of the shoe needs touch first, that's what toe out is.) The grip in wet weather is outstanding. And a detail of the stem from the side. The Nitto forged stem is a really beautiful piece of work. So what's next? 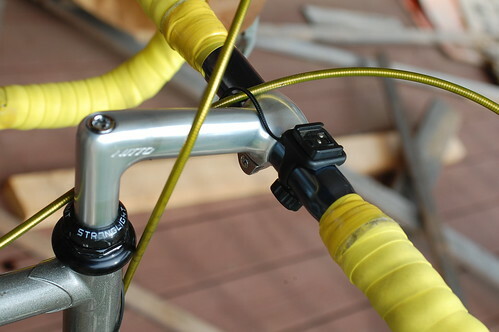 I have in hand the yellow SIS (shifter) cable, Cinelli Bar Tape, and the clamp on cable stop for the bar end shifter project. I should order the shifters themselves in a week or two. Installing a new headset isn't something that I'm likely to do more than once every 20 years or so, and the one I installed yesterday is the first one I've ever installed. Park Tools makes some Really Nice Tools for this task, but unless you're running a bike shop or otherwise doing a lot of this type of work, they're way too expensive to buy for just occasional use. What I'm about to describe is my budget approach to the same tasks. 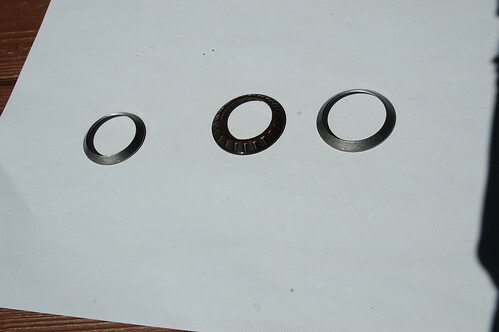 By way of background, a bicycle headset is a collection of bearings and related parts that permit you to steer your bicycle. 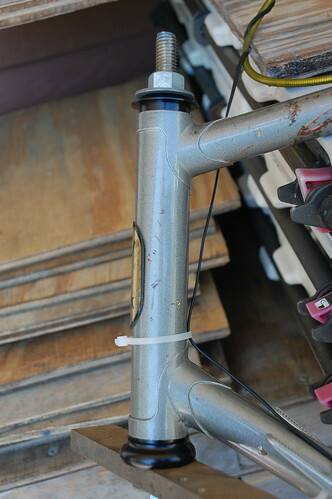 There are two bearings at the front, one at the top of the fork just before the tube disappears into the frame via the head tube, and one at the top of the head tube below the handlebar and stem. 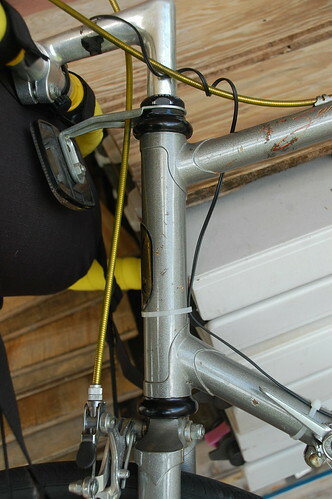 The 1984 Trek 500 came with a Tange MA-60 headset, an economical if somewhat heavy component which is still available in slightly different form today. it uses ball bearings contained in steel cages. like most headsets, the races are the cups (parts which are driven onto the frame & fork using an interference fit), which means that if you do need to replace the races due to wear, you need to replace the entire headset. 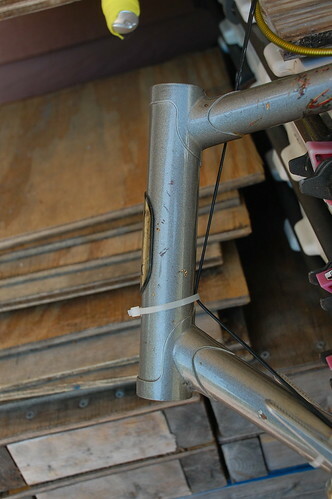 I got the Stronglight for my birthday; it has "Paramount" labeling, which apparently has to do with the high end Schwinn Paramount of the mid 1980s, which used the Stronglight A9. After I priced the special tools, I started plotting how to avoid buying them. Driving off the old cups and sets is fairly straightforward. 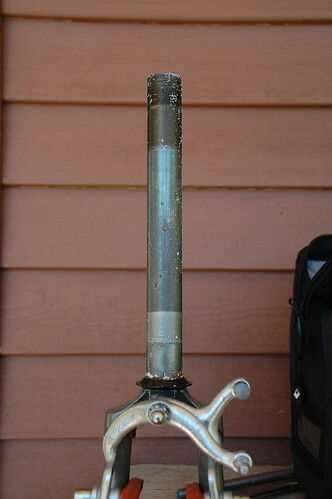 The cups on the head tube can be driven off with a 1' piece of copper water pipe and a hand sledge; once you've removed the front fork and steering tube from the bicycle, just stick the copper tube into the head tube, seat it against the edge of the cup you're trying to drive out, and have at it. switch from side to side so the cup doesn't get crooked and jammed on its way out, then drive the other cup out from the other side. The seat at the top of the fork can be driven off using a hammer and punch, again switching from side to side. Note that if the cups and seats are aluminum, they probably won't survive this treatment, but the steel Tange cups and seats i took off yesterday are probably reusable. 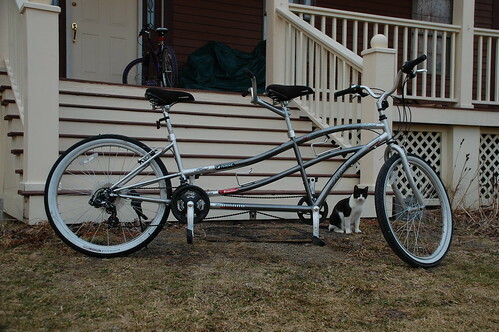 I own this tandem bike for obscure reasons. It has an involved backstory, which is told by Jason Crane in two parts: Part 1 and Part 2. I got the repaired rear wheel back from the Downtube a few weeks ago, and the replacement tire from them about 2 weeks later. Today, I finally enlisted the 13 year old to help me clean & lube the chains (they looked awful due to surface rust.) She did not think too much of her task, which was to hold the rear wheel up while I applied the various solutions to the chain. But she lived, and later I took it for a short (1 mile or so) ride (without anyone in back -- my daughter's time will come, though). The bike seems to work pretty well, there are concerns about shifting which I'll have to address, but it got me down the road and back. The front brakes are a bit grabby, the rears are not, probably some adjustment is needed in back. I had to remove the shoes to reinstall the wheel, and i didn't really line them up properly. I bought this bike new in 1984; this photo is of it this afternoon, after what I'll call the "completion" of the phase 1 upgrade. More photos appear in this Flickr set. This photo shows the bike in the original Trek brochure from 1984, and this one gives the original specification, along with the other Trek Sport models of 1984. 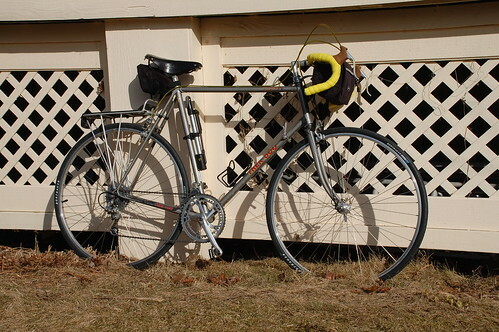 I rode the bike a bit, but not a huge amount, through about 1988, when for various reasons it got put away. It came back out a couple of years ago, a result of watching (and enjoying) the Tour de France on Versus, and pondering the nice bike I had and never rode. It needed tires and tubes, and went back out on the road. Over the next couple of years, I replaced the original Avocet saddle with a Brooks, and the original SR pedals and Lapize toe clips with a set of Shimano SPD pedals. However, I was still not really clued in about a lot of things about the bike. So this winter I decided to learn about maintenance, which had been very much neglected. Fortunately, I found Bicycle Tutor, which was an enormous help in figuring things out. But it didn't cover everything, there was a lot of research involved. Ok, not too much research involved in replacing the handlebar tape with new cork tape, but there were other research tasks. The real joker in the deck was when I figured out about the Atom Helicomatic hubs basically being a time bomb. It's well covered on the Sheldon Brown pages, a resource I hope sticks around: http://www.sheldonbrown.com/velos.html#helicomatic. Trek used these on lots of their bikes of the period, and likely the only reason mine were still intact was because the bike just sat for so long. Having figured this out, the next step was to figure out what to do about it. Being a mid-80s six speed, the rear fork spacing is 126mm, and to use modern hubs, I'd have to cold set (spread) the rear frame to 130mm, a procedure which often (but not always) works. I concluded I like this bike too much to take any risk like that, so no cold-set for me. I spent a bit of time on EBay, and came up with a good used pair of Campy Record hubs of the correct size but with no skewers, but the skewers were easy enough to find as well. I also found on EBay a NOS Suntour Ultra-7 freewheel, a type that was briefly produced that fit 7 cogs in the space of a traditional 6 speed freewheel. So I took the Campy hubs to The Downtube, a local Albany NY area bike shop to get some wheels built. This was where I discovered a flaw in my research. I had picked up 36 hole hubs, and as it happens, 36 spoke wheels are another thing that is passing away. Available rims are limited, 32 or 28 hole hubs would have been much better. The folks at the Downtube did convince me to convert from 27" wheels to 700C wheels, as there are more available options in 700C rims, but even so, the 36 spoke rims were backordered and it seemed like it was going to take forever. Then the owner of the store remembered he had some NOS 36 hole Rigida rims "out back" that had been sitting for years. Problem solved, now i have nice replacement wheels on the bike, with a nice NOS freewheel, and things are 100% better. This is the end of phase 1, the bike is working very well, the new freewheel is much quieter and shifts much more smoothly than the old one. Phase 2 is probably going to involve Shimano bar end shifters and a Stronglight A9 headset. I'll write about that someday. While wearing your bicycling outfit (spandex included), walk down to the bus to meet her as she gets home. Works every time!